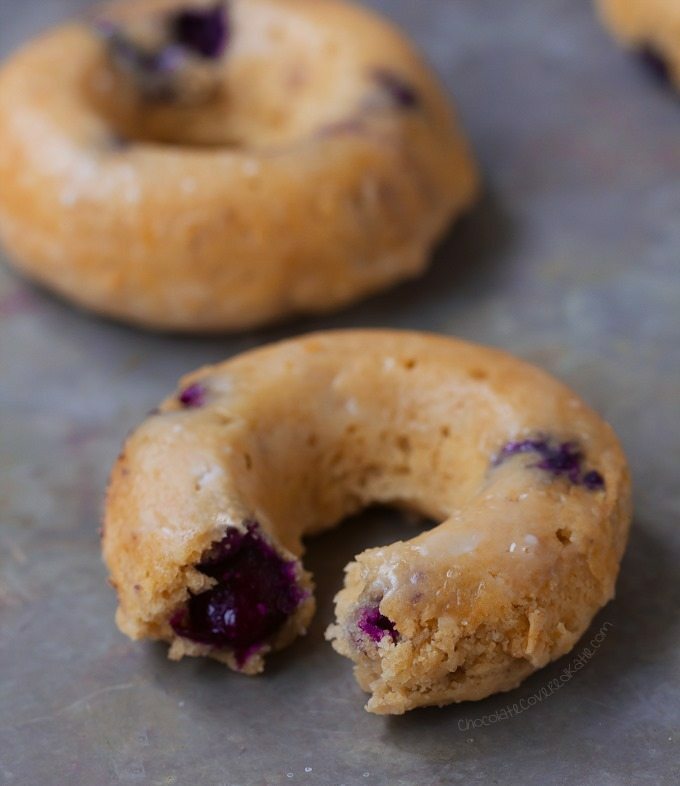 Blueberry Baked Donuts - Refined Sugar Free! 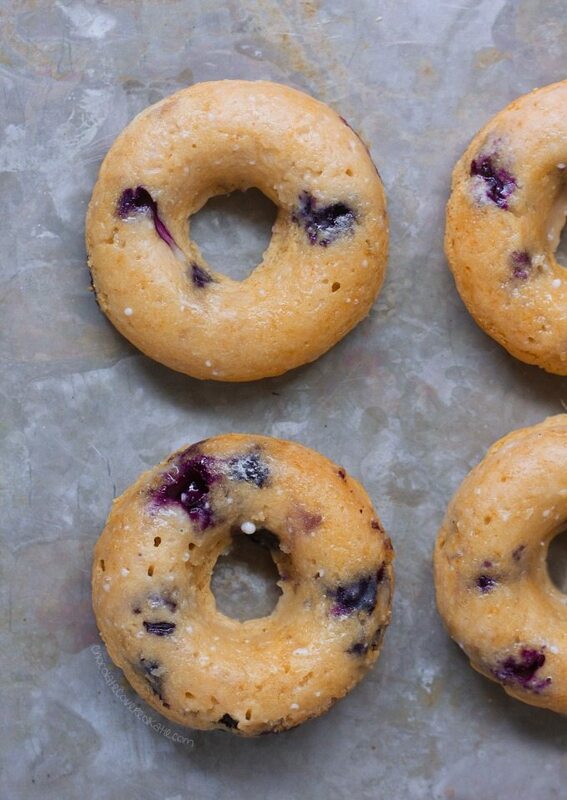 Home » Blueberry Baked Donuts – Refined Sugar Free! Last week, my apartment kitchen magically turned itself into a donut-making factory. And I have no complaints with that. Each morning was like going out to Dunkin Donuts… or really, it was like having my own personal Dunkin Donuts come to me, and I got to stay in my pajamas the whole time. I don’t know about you, but any time I get to choose between getting dressed or staying in pajamas, the pajama option will win. It’s not even a contest. The only hard part about having Dunkin Donuts in your kitchen is that you have to choose – Do I want a peanut butter donut today? Or one that is dripping with maple glaze? Maybe I want a chocolate donut with sprinkles? Or a big, fat blueberry muffin in donut form. Yes, today I think I will go with the blueberry muffin. 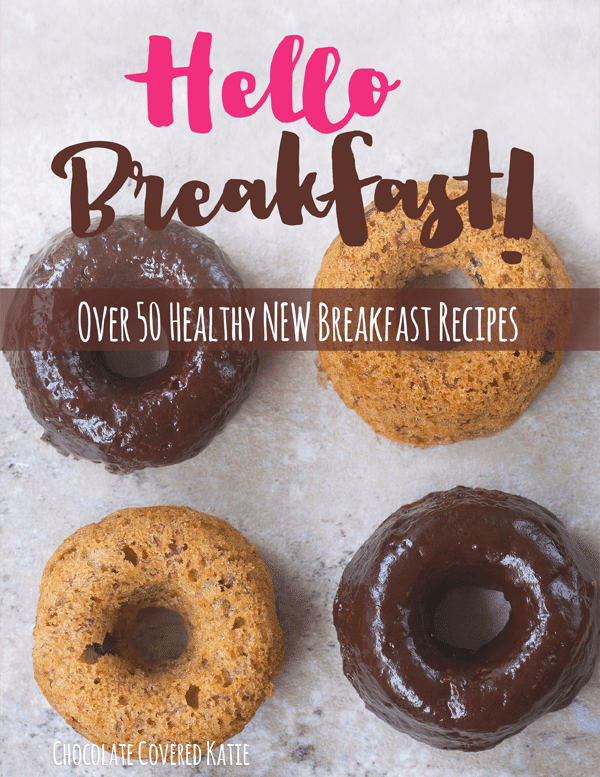 Due to popular reader demand, I made the donuts refined-sugar-free this time, so you don’t need to use any granulated sugar here. None of the refined sugar, all of the deliciousness. 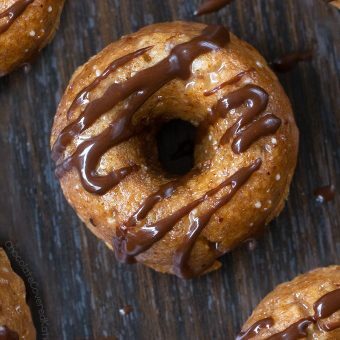 Vegan baked donuts that can be whole-grain or even gluten-free. P.S. Do these pictures look familiar? I know people love seeing in-process photos, but my kitchen is so dark that I have to go over to another part of the apartment to get enough light. Once the liquid begins reacting with the dry ingredients in baked goods, my goal is to get that batter into the oven ASAP! Hmmmm now I am wondering about how Blueberry Sour Cream Coffee Donuts might taste. Back to the kitchen donut factory!!! If you want to make the donuts and post a photo, feel free to tag @ChocolateCoveredKatie on Instagram so I can see and like your pictures! Combine first 5 ingredients, and set aside. 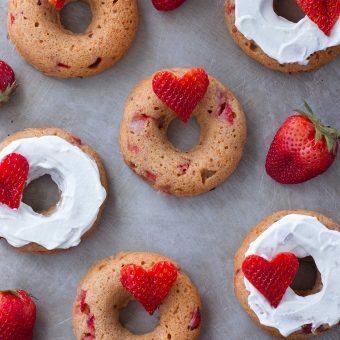 Grease a donut pan OR mini muffin pan, and preheat oven to 350 F. Stir together all remaining ingredients except berries, then pour wet into dry once oven is preheated, and stir until just evenly mixed. Don’t overmix. 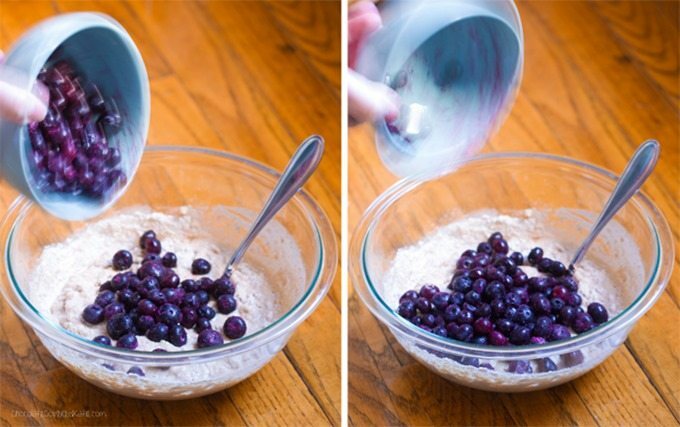 Either stir the blueberries in very carefully so they don’t break and turn everything purple, or press them in after portioning the batter into the pan. Bake 10-12 minutes (depending on flour used), or until donuts have risen and batter is no longer wet. Let sit 5 minutes before removing from the pan. Frost with a basic glaze or even straight-up coconut butter, which is my favorite! These look fantastic!! 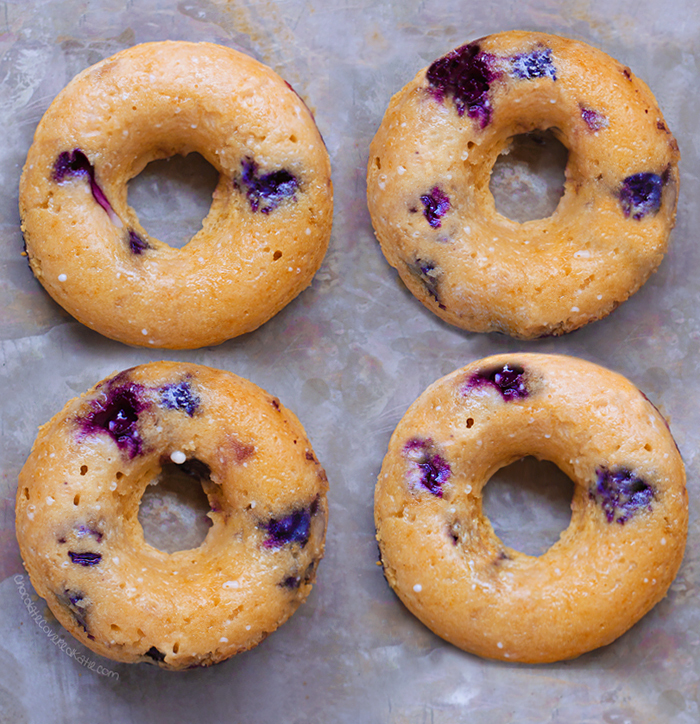 Blueberry donuts were always my favorite as a kid – pinned until I get my hands on a donut pan! Excuse me, but you’re talking to a former member of Team Krispy Kreme! Note that I never joined another donut shop fandom since XD these blueberry muffin donuts look AMAZING. I can imagine how awesome they taste with peanut butter or your marshmallow whip on top! Would these work with buckwheat flour or oat flour? Donuts made with oat flour are very chewy, which some people might not like… but it depends on your tastes. They do hold their shape with oat flour, so it’s just a matter of texture preference. 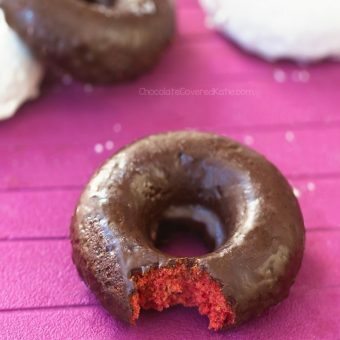 I’ve not tried donuts with buckwheat flour. Would these be good with some lemon juice and zest, or is the sweetness not strong enough to balance it out? Sorry, I haven’t tried so I really can’t say! You should be able to do almond flour fine! I have a similar recipie. Can’t wait to try cckaties!! Wow you are fast! Thank you for making them! Did you melt the oil? These were amazing! When I first received the email with this recipe, I wanted to make it! I had all the ingredients and some of my housemates are either lactose intolerant, or are allergic to gluten. I made this recipe with a homemade gluten-free flour mix, along with agave nectar, applesauce, cinnamon, cashew milk, and strawberries (because I didn’t have any blueberries). It was amazing, except, I might omit the strawberries next time because it was really sour in comparison to the rest of the batter! My housemates loved them though! Thank you so much for the recipe and your creativity! Keep it up! Thank you so much for making them already. That makes me really happy! Does your gf flour mix have xanam gum? I’ve made donuts from this base recipe with both Bob’s and Arrowhead Mills gf all purpose. In recipes I’ve tried, they seem to work similarly. I also stopped adding xanthan gum with those flours after once making muffins and forgetting to add it, then noticing I couldn’t tell a difference. Ahhhhhh, this looks a-m-a-z-i-n-g!! Thanks for the great recipe! 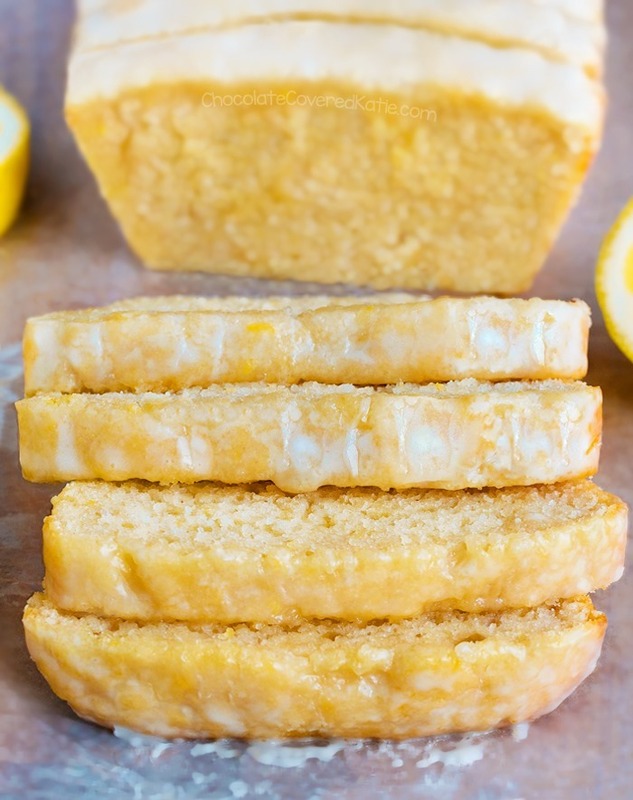 I’m going to ask my children, Katie ☺ and Julian, to help me make these with almond flour. As soon as we’ve tried them, I’ll report back. Thanks for the recipe, Katie! How did these come out with almond flour? I am SO excited to see this recipe! I am on a GF and DF diet and blueberry donuts are my favorite! I haven’t had one in such a long time! Thank you so much! This might be a dumb question, but how do the doughnuts end up having a doughnut shape with a hole in the center? Not a dumb question – they sell baked donut pans – YAY! 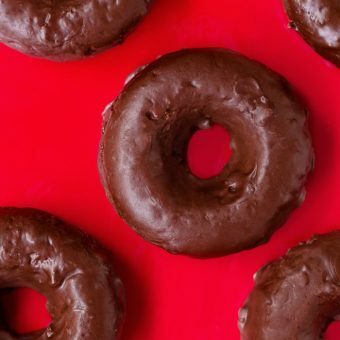 Such a great & easy way to get a donut without having to fry them – YUCK! 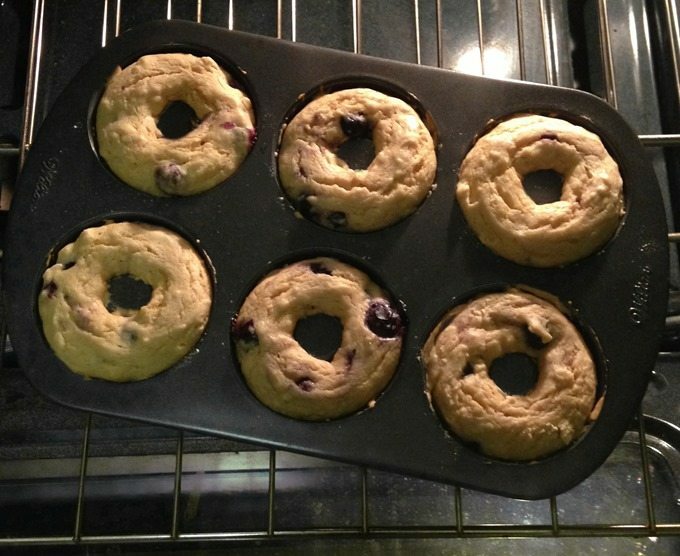 can i put batter in muffin tins (regular size)? i do not have mini muffin tins nor a donut pan…Would cooking time/ temp change? You can use a regular muffin pan, with foil rolled in the middle to make the hole ? These look great! 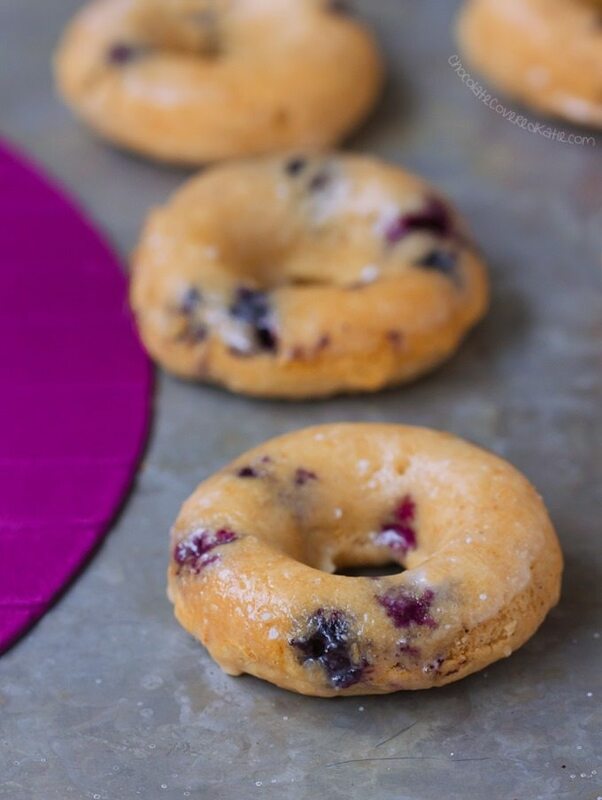 Blueberry Sour Cream Coffee Donuts sound divine too! These look delicious! How long do they keep, and do they need to be stored in the fridge? 2-3 days unfridged, 4-5 fridge, a few months frozen. How would you freeze them? My four year old has never had doughnuts! This will change our world. 🙂 so excited to try!! Just freeze in a plastic or glass container, with parchment between each donut so they don’t stick together. Hi Katie– made these for my kids tonight in honor of National Donut Day (!) and they were a hit. I made mine in mini muffin tins (rendered 15), used almond milk, maple syrup (less than 1/3 c), pinch of cinnamon, and regular flour. I actually forgot to add the vinegar. I’m not sure how that ingredient affects the recipe’s outcome, but we didn’t notice anything, so I was glad it still worked out. I tossed mine in a little powdered sugar and we ate them while they were still warm. The good and bad news is there weren’t any leftovers! Thanks for the recipe. I will try it in the Babycakes Donut Maker next time. I don’t love that appliance because you can’t peek to see if they’re ready, it is kind of trial and error to know when they are done (or more aptly, not overcooked), but these were so tender, I think it might work. This is not a diabetic blog. Many of us prefer to use less refined products but still love our sweets and LOVE the idea of using coconut palm sugar, agave, or maple syrup. THANK YOU KATIE! Go find a diabetes blog or just try your own substitution and see if it works! But don’t criticize or try to “educate” just because she doesn’t meet your personal special needs. i agree with Danielle above – besides, Katie didn’t make any written claims that these are diabetic friendly so it’s not fair to attack her on that point. as a diabetic you should be well informed about which sweeteners you can and cannot have, so go ahead and substitute or leave out. recipes are written and shared as a guideline and inspiration, so why not use Katie’s ideas as a base and play around to adapt and make them suitable for your own dietary needs? if you find something that works, you can always post a comment and tell everyone what you did to make a particular recipe diabetic friendly 🙂 that way you contribute positively instead of being negative. Katie is always happy when people report back with changes they made to make her recipes work for their individual needs, it will help her to take them into account when providing possible substitution ideas in future recipes. I made these today for my friend and they turned out perfectly! Thanks!